Please forward your photos with relevant details to the email used during our previous communication, or get in touch with us by clicking here. We promise to keep all your data safe and will not forward anything to a third party. Likewise, none of these photos may be copied from this website. All photos and designs on this website are copyright - see 'Customer Care' above. 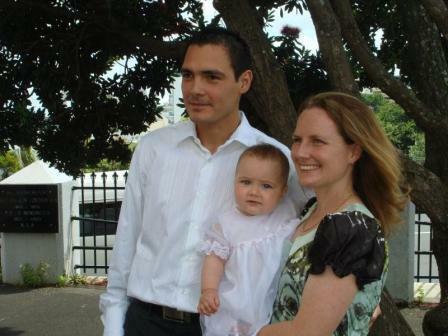 TAKEN ON HIS BAPTISM DAY. ... and outside church with their parents. Thank you for sharing these photos with us! 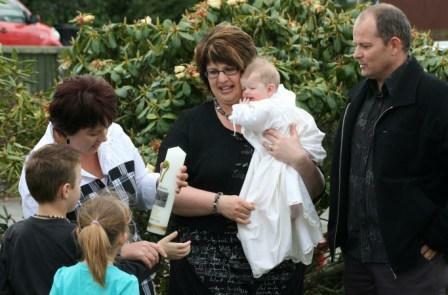 To view our baptism candle selection, click 'Babies & Children' >'Baptism' on the category index. 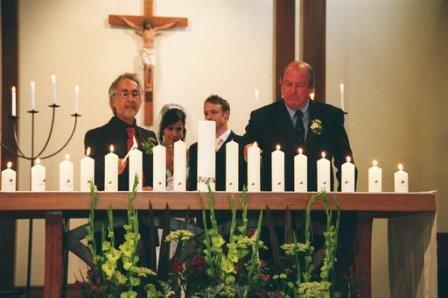 ... and lit their unity candle during the ceremony. We wish them a long and happy marriage! 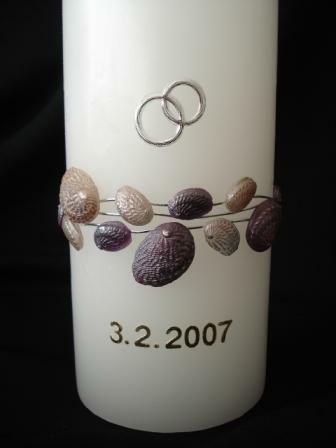 To view the full candle description, see Weddings > Unity Candles. 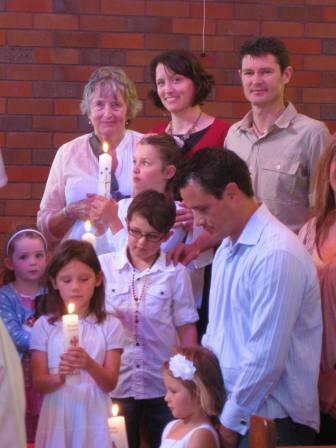 During the beautiful service, the bride & groom's mothers lit the side candles, followed by Mira and Fergus transferring the flames to light their unity candle. 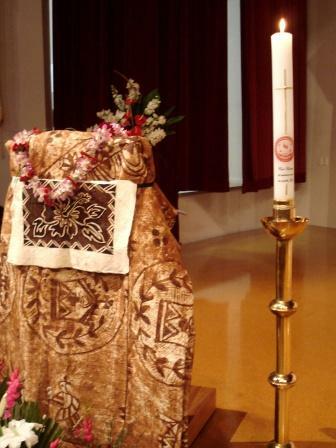 Please click here to view the full candle description. 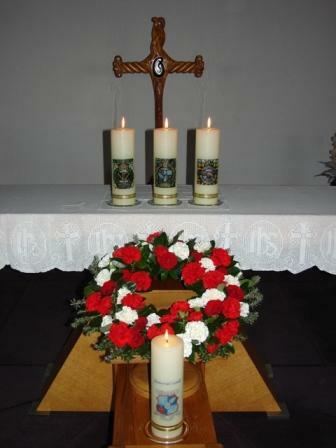 ... included a lighting ceremony with their special set of candles which can be viewed in detail here. 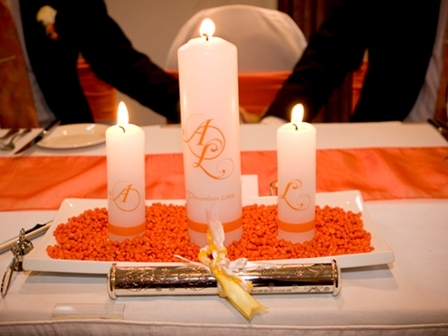 The candles feature a stylised hibiscus flower, designed by the bride's brother, and a matching light blue wax band in the wedding colours. 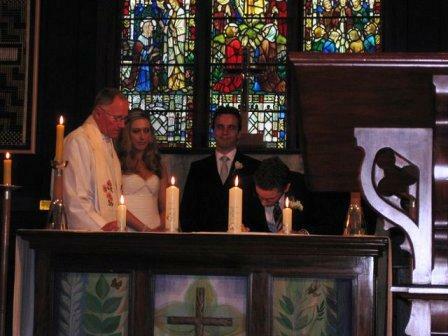 "We absolutely loved the candles and are glad we made our wedding that extra bit more special with them." Photos courtesy of Gareth Robins from ShotbyRobins. 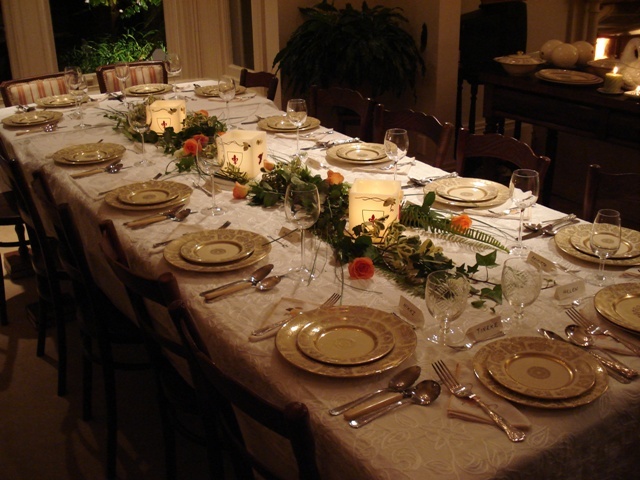 ... was first lit as the centrepiece during a gathering of his friends. It is now a comforting reminder at his family home, arranged with special beach stones, one for each of his young years. Sebastian's Mum sent these words: " .. I can't wait to light it to see how it looks with the flame and glow. Thank you. 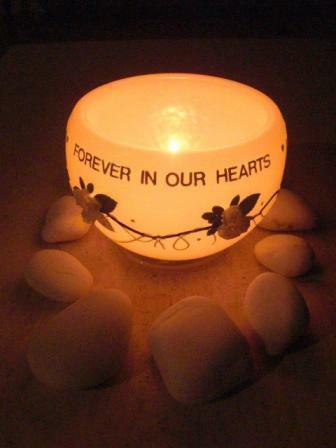 It will make his memorial gathering very special and something we can light and enjoy on significant anniversaries. To view the candle description please click here. ... lit their Unity Candle against this beautifully serene backdrop during their wedding ceremony at Castaways in May 2011. 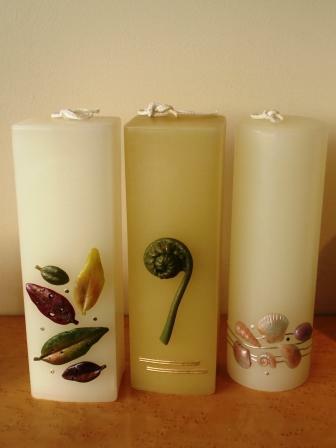 Their union of Cook Island and Scottish heritage was expressed on their customised candles through delicate wax frangipani flowers and a printed band of the same Davidson Clan tartan which Gary was wearing. 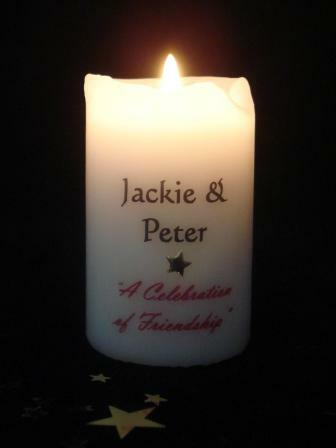 Please use this link to view Karlene & Gary's candles. Karlene & Gary also kindly provided us with a testimonial. "Thanks again for your hard work on them, as yes, we are very satisfied with the end result". 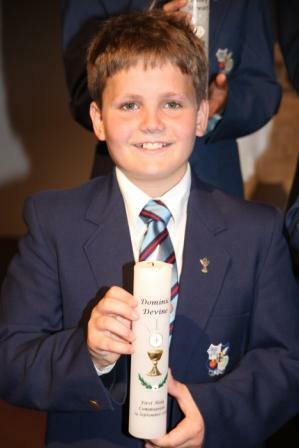 To view more photos and the candle descriptions, please click here. 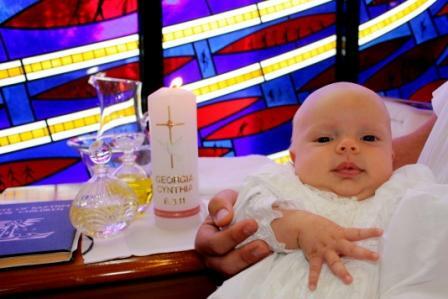 Little Georgia was baptised in Auckland in March 2011, and her Mum & Dad sent us this email soon after: "... Georgia's baptism went really well last weekend. 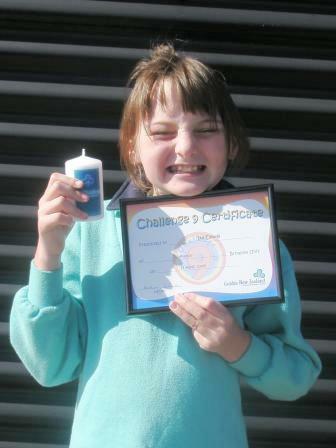 I have attached a couple of photos of her with her special candle. It is absolutely beautiful!! I would also like to thank you for the fantastic service you provided. You were so prompt to reply to my queries and very friendly and helpful. It was a pleasure to do business with you. We will definitely recommend you to others and use you again in the future. 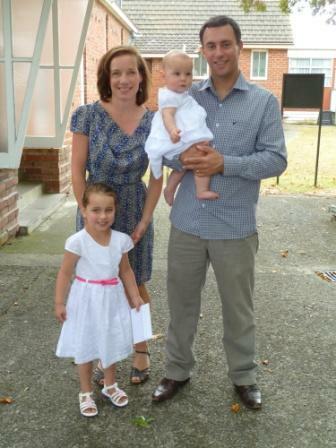 A big day in Katie and Tom's life, as they were baptised at their parish church, supported by their family. Here Katie and Tom proudly show their baptism candles, which were designed by them to make them truly personal and a lasting reminder of their ceremony. 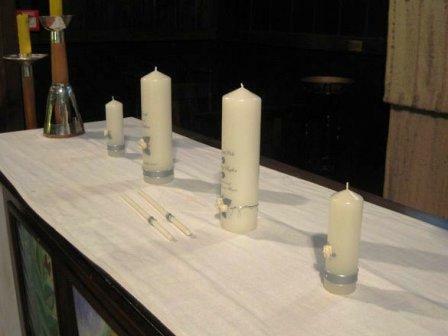 "The wedding was perfect and your lovely candles helped to make the ceremony very special." Sarah and Matthew's beautiful Unity Candle Set consisted of the main candle, two family candles and the long slim tapers. 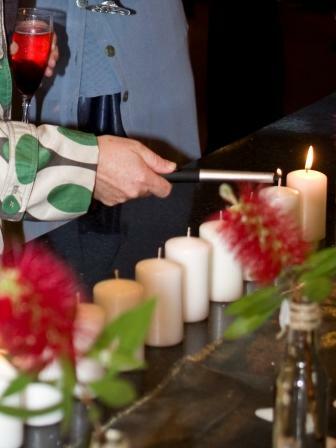 The matching Remembrance Candle created a presence and connection with those relatives who were no longer able to attend the ceremony. Off-white roses with silver accents and a script font for the text featured on cream candles, perfect for the stylish surroundings of the Chapel. 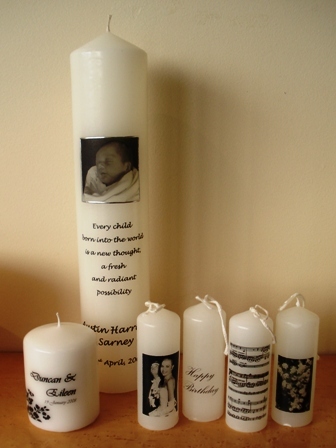 To view the description of Sarah & Matthew's candles, please click here. 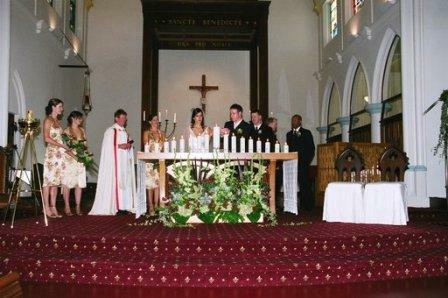 "As promised please find attached a couple of photos from our Wedding with the beautiful candles you created for us. I just wanted to let you know how absolutely happy we were with the candles. We didn't really know what we wanted to start with, but with your help created a concept that absolutely reflected the theme of our wedding and the essence of us. The candles are devine and totally exceeded our expectations. They looked amazing on the day and are a tangible piece of the day that we can keep forever. I would highly recommend your services to anyone. Thank you so much!" 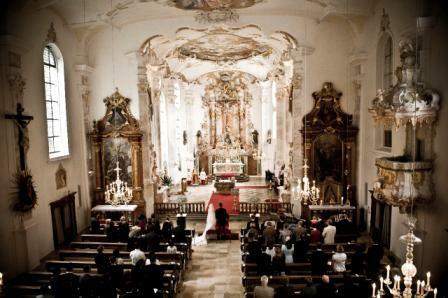 Shown here during the Lighting Ceremony and with their wedding party on the steps outside. Lisa's photos are simply stunning and will no doubt grace the pages of a magazine soon. 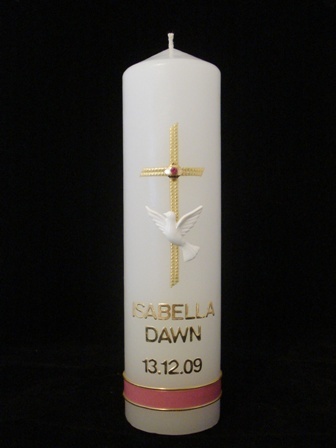 To view the full candle description, please click here. Photos with permission of Rob Driessen. 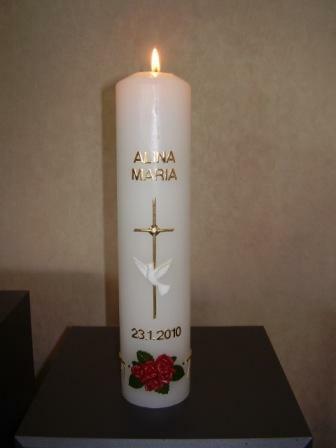 It measures a tall 300x65mm and features a cluster of red roses and gold garlands right around the base of the candle. 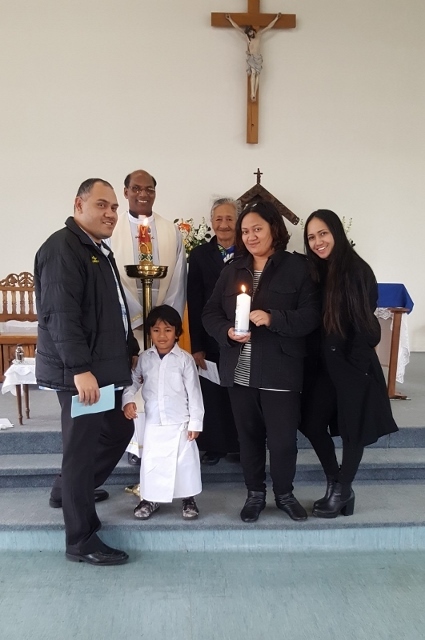 "All went well at Alina's christening and everybody admired the candle you made ..."
Click here for the full description of the candle. We had a lovely day in Arrowtown for the Baptism of our granddaugter, Edie Francine Spary and the highlight was Edie clapping right at the finish! Attached is a collage of all involved. 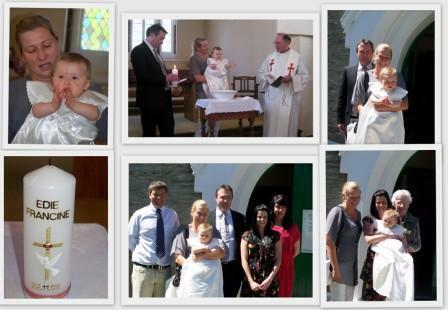 Candle ... Mum, Dad, Edie & godparents ... 3 generations of godparents! Lots of lovely comments on the candle. I hope it will generate more business in the future. 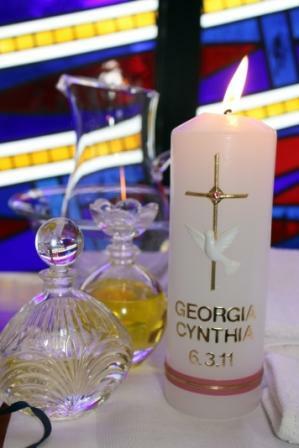 "We just wanted to say thank you for the most beautiful candle! We loved it! Just beautiful. We also got asked by heaps of people where we got it from so I have passed on your details to 3 different people now! Many thanks Holly & Pablo! 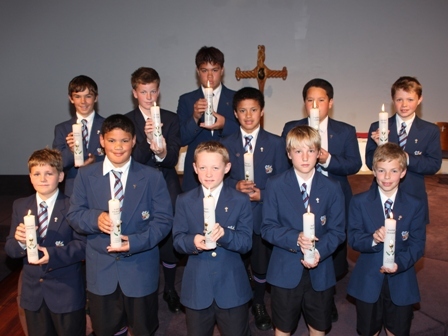 A group of eleven fine young Sacred Heart College students celebrated their First Holy Communion in September. please click here (listed under 'Religious Occasions). 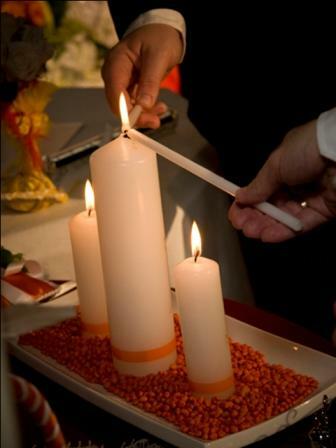 This stylish Unity Candle Set formed an integral part of the ceremony, when each partner first lit their own candle and then together transferred the flames to light the main candle. 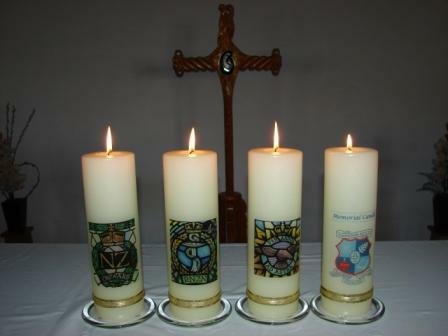 Click here to view the candle descriptions. Andrew Slessor was the winner of our VERVE Magazine Competition held in October 2009. 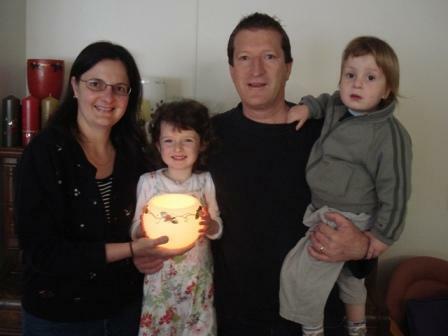 The pink and gold rose bowl soon became "Amy's Candle" and we were delighted to also meet her mum AnnaMarie and her brother Lucas when the family came to the studio to pick up their prize. 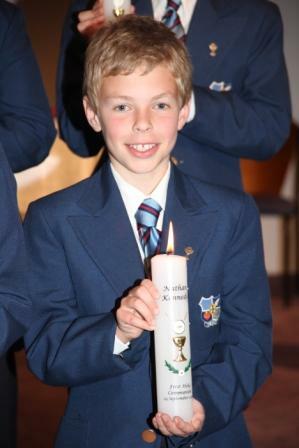 Please click here to view the candle description. 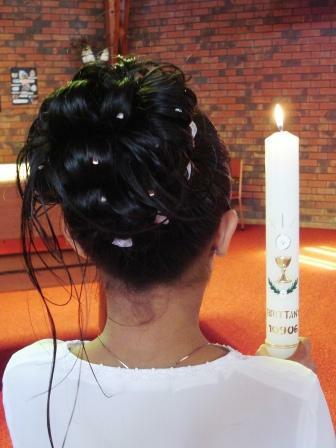 These photos were kindly sent by Erin-Renee's parents to show us their special candle in use on the day. 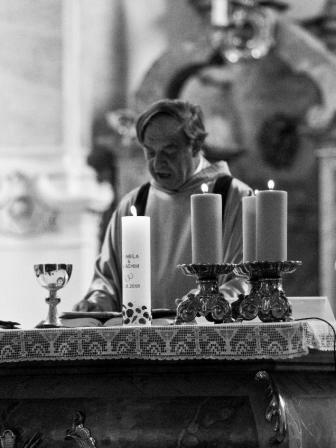 Any such photos are very precious to us, as, quite literally, they bring our candles 'to light'. Hope these two photos are ok. 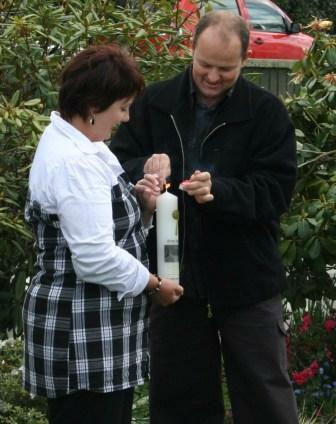 It was rather breezy on Sunday so lighting the candle was a little bit of a mission but we got there! 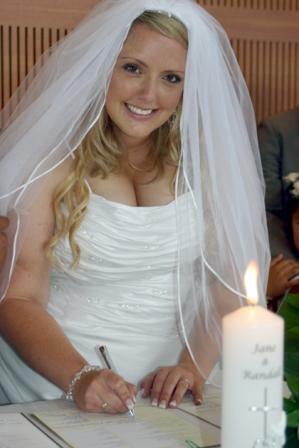 I thought the candle looked just great and my sister proudly held it through the ceremony. We had lots of wonderful comments on how beautiful it was and where had we got it?!! Everything went really well and we all had a great day. Thankyou again for making the occasion extra special. We have carefully wrapped the candle up again and stored it away to show Erin-Renee one day. Hopefully we'll be in touch in the future, needing another candle! 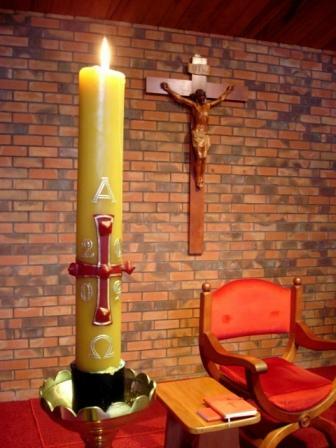 To view the description of this candle, please click here. 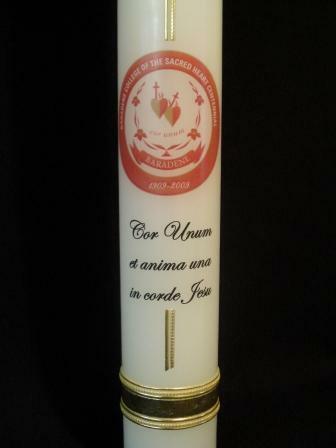 Commemorating Baradene College's Centenary, this 600x65mm candle was lit during the Opening Mass and at other occasions throughout the Jubilee Weekend. For the full description please click here. ... at the altar of Our Mother of Perpetual Help Catholic Church in Glendowie, Auckland. 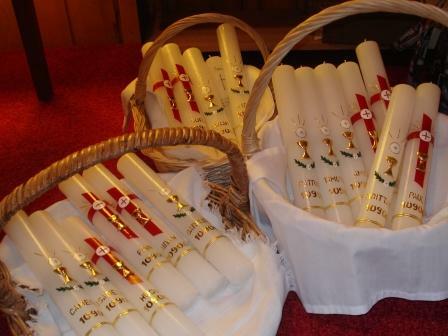 For the full description of these popular beeswax candles, please click here (listed under 'Churches'). Attended by the Governor General, His Excellency Anand Satyanand, and many other Old Boys including those now serving in the Defence Forces. To view a description of these candles please click here. What a party! 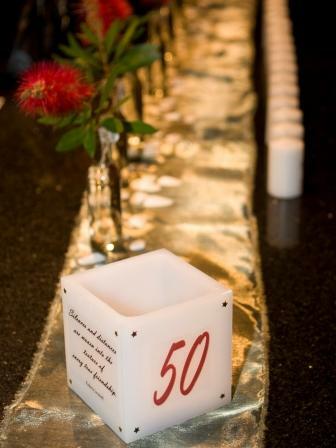 On arrival, each guest lit their own personalised candle ('You light up my life") and placed it in different areas around the room. This created a magical atmosphere. 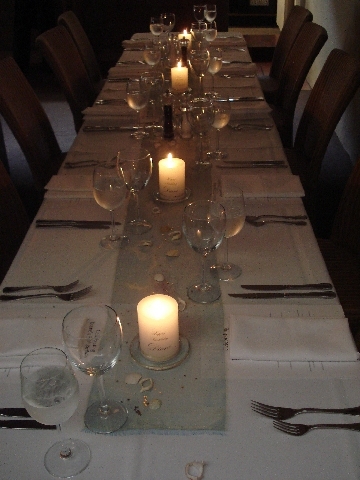 At the end of the evening, the candles were wrapped for guests to take home as a treasured reminder of the evening. 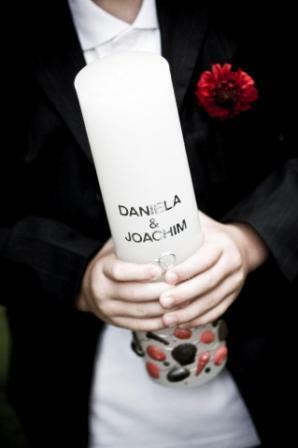 This candle was a creation for my dear friends in Germany, who enjoyed a fairytale wedding in glorious surroundings. 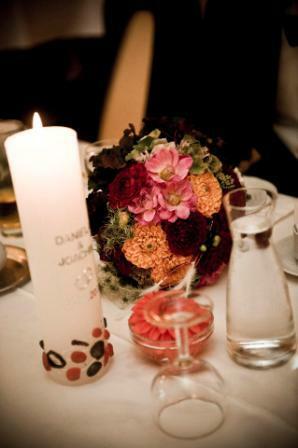 Shades of orange and brown with silver was the colour theme throughout their stationery, flowers and decorations. A large selection of Coromandel sea shells, specially poured in these tones in wax, reminded the couple of their happy time spent in New Zealand. These cube vessels embellished with cream roses, musical notes and fleur de lis created a warm soft light during HELEN's French themed dinner party. 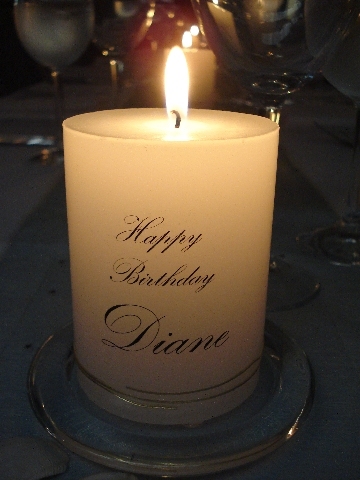 Simple but elegant pillars feature the same message on opposite sides of the candle, and together with fine gold wax bands set the tone at DIANE's Birthday Party. 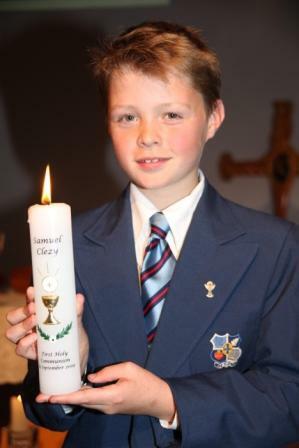 To view or range of First Communion Candles, please click here. 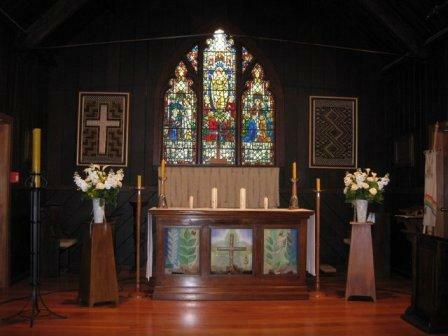 St Benedict's Church in Auckland provided the perfect surroundings for the wedding of SARA and SIMON VALENTINE. 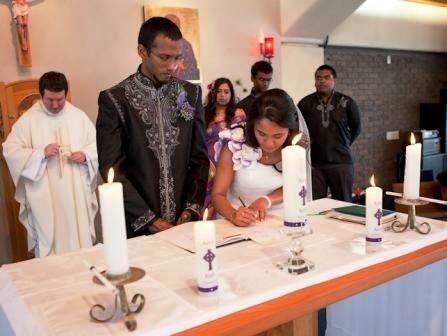 Their paua-themed candle set consisted of 17 candles, and each side candle - ranging in size from 125 to 300mm - was lit individually by family members of the bride and the groom. 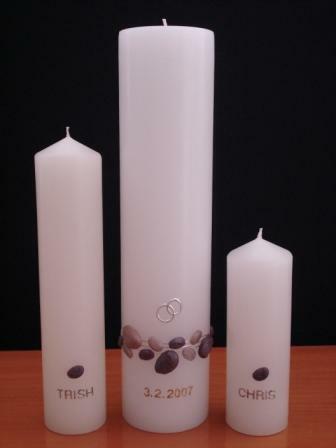 To view the description of these candles, please click here.